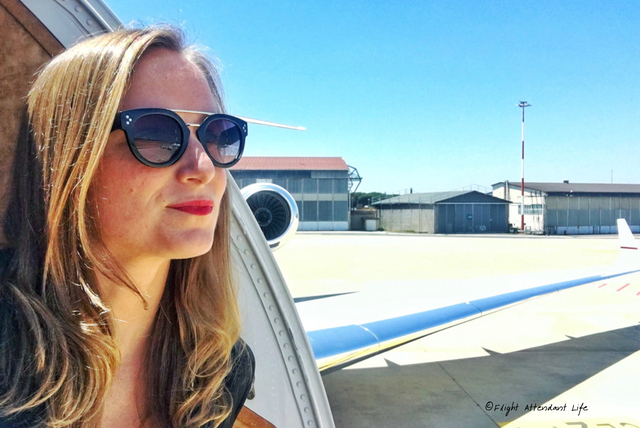 » Getting Hired as a Flight Attendant: Do This! NOT That! Getting Hired as a Flight Attendant: Do This! NOT That! The most popular searches and interests about flight attendant life relates to you wanting to know what airlines to work for and how to get a job in aviation. You want to know how to do it, what airlines ask in the interview, and how to succeed. You want to know, if you are in corporate aviation, how do I get hired? I want to know this, too. Sometimes the hiring landscape and the way airlines and corporate jet owners hire doesn’t make sense. Literally, the latter could be because you look like an ex-girlfriend, a billionaire didn’t like your hair, or you have a social media following. Whatever the reason may be, you might never find out what you did wrong or what you did right and that can be so incredibly frustrating. In November of 2016, I went into an airline interview and KILLED it! I had NEVER done that well in an interview, and you know what happened? I got that email a week or so later that said, “Thank you so much for applying, but you have NOT been chosen at this time. We would love for you to apply again next year!” Bummer. To this day, I don’t know if it was because I put the wrong address for a former apartment I lived at or that I talked about writing too much. The thing is, I’ll never know, and that’s ok! What I do know and believe completely is that I showed up as my best self; completely present, 100 percent invested, and enthusiastic about having a chance to work for that company. At the end of the day, that’s all you can do! That’s all you can ever do. You can’t control outcomes, but you can control the process. I also need to tell you to keep your chin up— ESPECIALLY those of you in corporate aviation. You need to congratulate yourself on the little wins of even getting a callback or having the opportunity to apply for certain jobs. The job landscape is SO competitive that having a chance to interview is a great achievement. Celebrate that while continuing to work hard at landing a gig. You may be new to aviation— commercial or corporate. You are so new in fact that you have never worked on an airplane. Due to this, you think that you don’t have a chance. To that, I’ll tell you, you are wrong. You have a huge chance, ESPECIALLY if you are applying to work for a commercial airline. Often, airlines like individuals who are new to the industry. They can train you and mold you and you have yet to be jaded by the downsides and difficulties. We all have to face rejection, even the most experienced of us. I have a quite diverse and extensive flight attendant resume and yet, I’ve received many rejections. Don’t take the ‘no’s’ so hard or as a negative. Take them as being one step closer to a ‘yes’— to where you are meant to be. If that airline I had interviewed for in November had never said ‘no’ to me, I would have never jumped into corporate aviation; which by far has been the biggest growth opportunity and learning experience for me as an individual and a woman. I would have never had to fight through so much unknown and be forced to fall back on my writing in the way that I have due to breaking my ankle. I built a deeper belief and confidence in myself due to rejection and for that, I can be forever grateful. Airlines and corporate jet pilots and owners hire for differently, but I can promise you, neither will choose you strictly based upon what experience your resume communicates. What your resume says will never be the defining factor as to why you are hired. Billionaire investor Chris Sacca says that what he questions, among other elements, when hiring is, “Is this person interesting?” According to Mark Zuckerberg, he wants people surrounding him who are more intelligent and better at him in areas where he is not as strong. Studies have shown that the two definitive traits that will most determine success are curiosity and persistence. Persistence will push you forward when all you want to do is fall, and curiosity will fuel you when everyone else says “be rational.” Rational never lived unconventional or changed the world. When you can find and develop persistence and curiosity, you will discover how unstoppable and amazing you are. If you want to get hired as a flight attendant, I’ll let you in on a secret. I want you to focus on what you can control in your next interview. I’m working on this in my own life to be better at handling unknowns and inconveniences and help me when I meet new people. I want us to be SO subtly POWERFUL, that we walk into a room or onto a plane, and heads turn due to our presence and energy. You have that and so do I, but it needs to be developed and shaped. I highly recommend you buy and read the book “Presence” by Amy Cuddy. I highly recommend that you constantly read and fill your mind with information that makes you grow. Why Amy’s book is so valuable is communicated through the tagline which states, “Bringing your boldest self to life’s biggest challenges.” When you go into a corporate jet or airline interview, it’s nerve racking! Those nerves exist because you care. Instead of seeing those emotions as something you need to brush away, use that energy. There is a very fine line between feeling nervous and feeling excited. You choose your definition. Harness that nervous energy into engaged excitement. As humans, we make assumptions about people based on immediate impressions. They may not be accurate or correct, but this type of evaluation process is normal. When you go into an aviation interview, do you really know how you are communicating your presence to the HR managers and other interviewees? Be bold, brave, beautiful, and believe! You have it in you. Think on what you want out of the experience instead of contemplating all that you are afraid of happening. You have to understand how valuable you are, what you offer, and communicate that when it really counts.